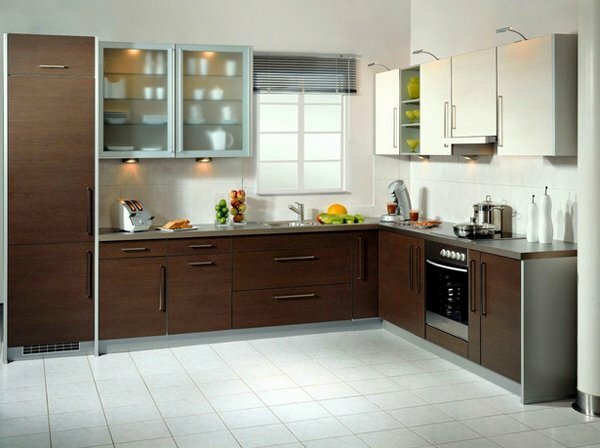 If you are planning to have a larger kitchen working space, having an L-shaped kitchen may just be for you. Regular kitchen has this one long slab of granite on their wooden cabinets and has it all in one area, but getting the L-shaped layout makes your kitchen or anybody’s kitchen more functional and attractive. There are a lot of things to love it, and we will tell you why. 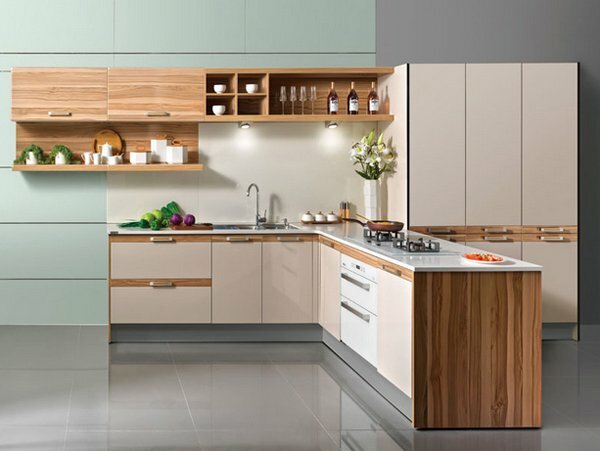 Today, we will be showing you 15 Beautiful L-Shaped Kitchens which gives you more ideas as to how as to how to make your kitchen spaces make more storage accessible. There are a some ideas that you can use such as creating a display, un-overpopulate your walls, having more drawer space and breaking up a solid run. Honestly, the list is endless, but let us go ahead and check out the photos below! 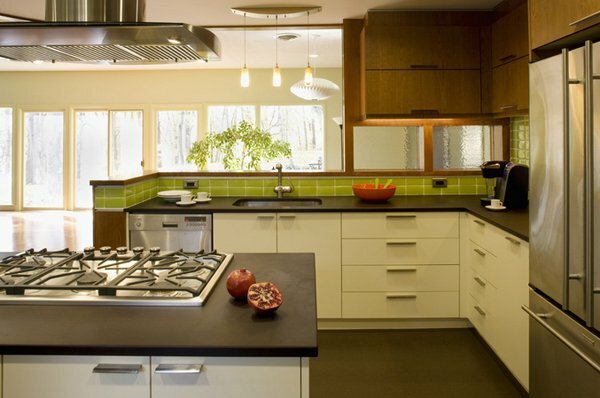 We see a fab black and white kitchen with an L-shaped design for the counters. 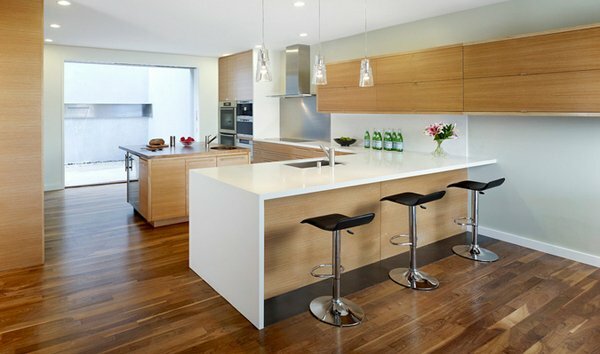 The design has clean lines, modern materials and just enough air to create a happy aura for this lovely kitchen. The grain on the cabinet doors is just lovely! The browns were played really well. Elemental Design did a really good job! The detailing for this kitchen is space is just fancy! The ceiling treatment, the counter for the island and the backsplash are heaven! They are really stunning and really fun to look at! View of the open plan kitchen and dining area and thought the floor to ceiling window to the backyard. Note the colors of the kitchen, the table and the lamp – we just love them! 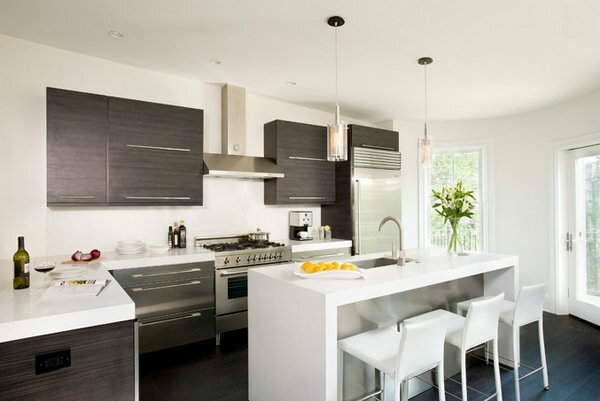 Dark brown cabinets below the countertops paired with white glossy top cabinets make a great pair! All the whites in this kitchen space go down the drain because of the browns matched with it. Even the blue chairs made a statement in this one! 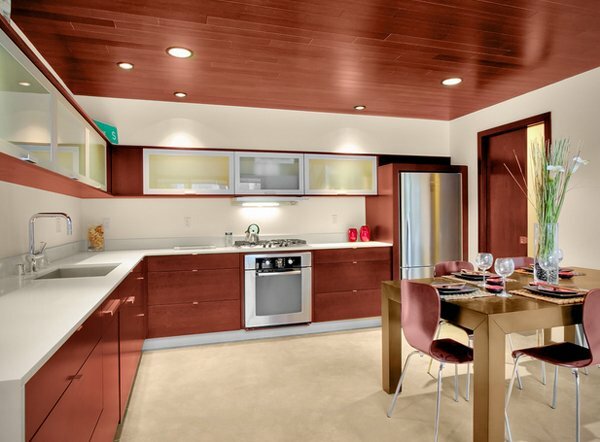 We love the color palette used for this modular kitchen from Oppein Global. The design is feminine – it’s clean and subtle which means you can always recreate the space by adding more colors to it. 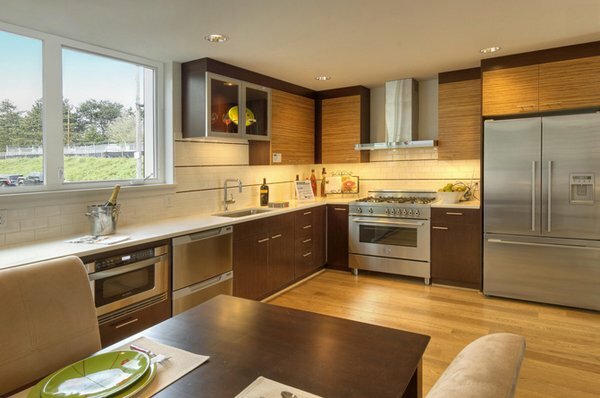 Look at the tall, narrow cabinetry which is actually a refrigerator. Another trick for creating a unique fridge is changing the shape. We’re so used to seeing wide, boxy designs that this sleek version can’t help but trick the eye. After the countertops are installed, it’s time to think about backsplash installation and painting. Your counter sets the lower line for your tile, so even though you could install the tile before templating, you’ll get a better-looking backsplash if you wait. 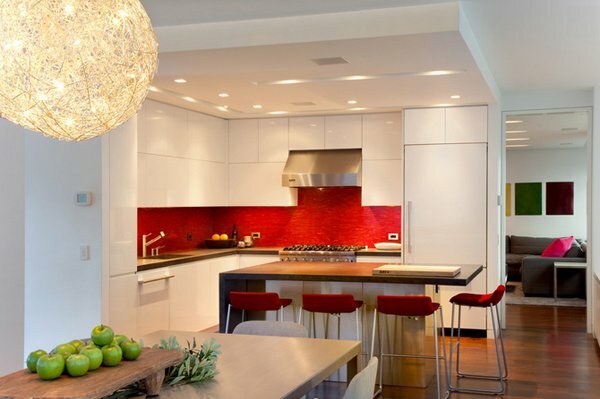 A white kitchen with dashes of reds on the chairs and the backsplash is just lovely! The kitchen is actually smaller than usual spaces but the L-shaped modular kitchen gave more working space for our home cook! The countertop is fabulous! It has clean lines, it’s sleek and the neutral palette is just stunning! 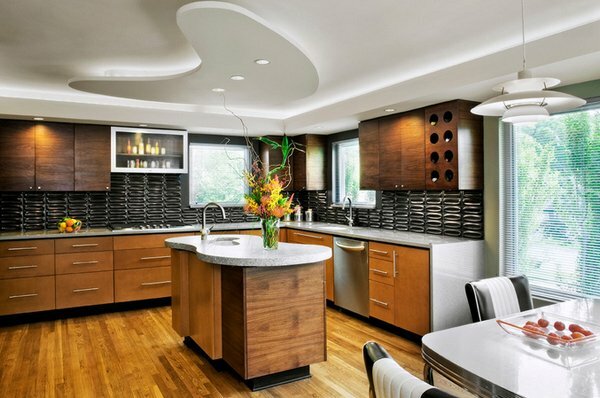 This large kitchen space is pretty much made more spacious because of the L-shaped kitchen was designed with. The wooden finish is elegant and real neat. Lighting was also considered impeccably. The cabinet doors look really awesome which very much complements with the bronze-like color for the drawers and the hardware. Really interesting color play along with the ceiling and the chairs. Here the designer has opted for Eames Shell chairs with wooden legs. 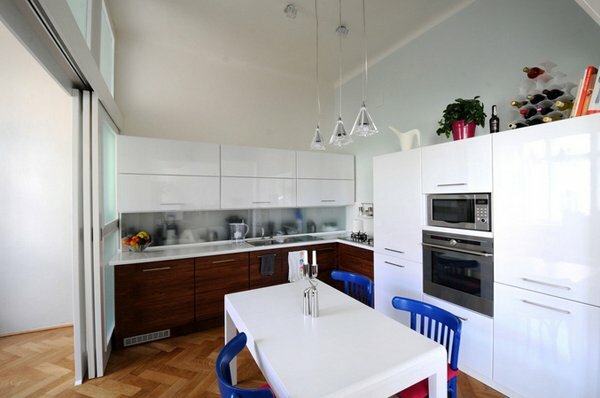 They stand out next to all of the white in this eat-in kitchen. 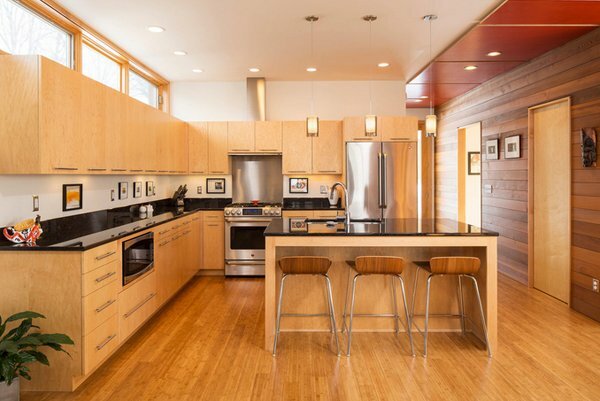 This Minneapolis kitchen is simple but really pretty. 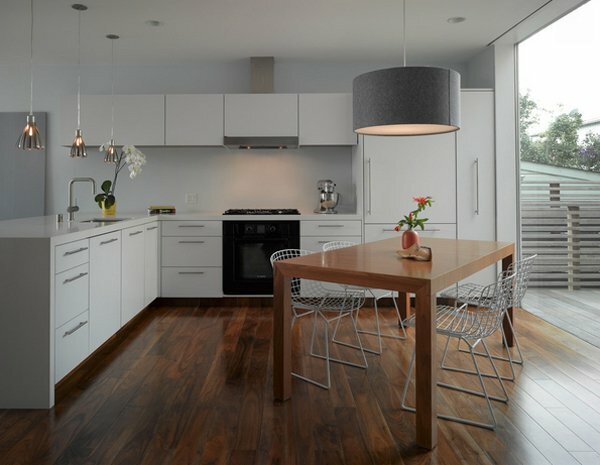 The L-shaped counters give way to more function and space to this modern kitchen. This picture says a thousand words about hiring a professional photographer and interior stylist when shooting interiors. But let us just say that the Coconut Chair in the distance plays off a strong angle created by this island and the coordinating angle on the ceiling. 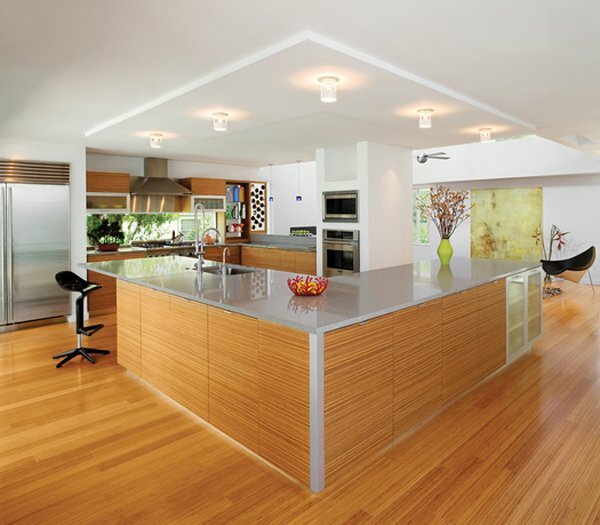 There are a lot of elements to creating a fabulous kitchen space because of how one area can seem more functional because of the overall feel you will have when you successfully create your kitchen as amazing as the 15 Beautiful L-Shaped Kitchens above. Tell us about your kitchen stories and also, do check out the 15 Different Granite Kitchen Countertops that can surely be a stunning design for any home! 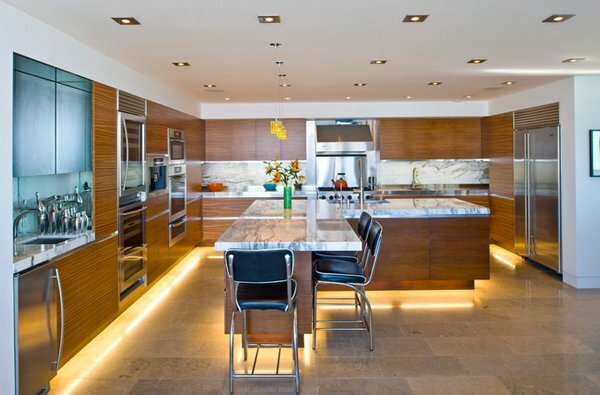 The idea of putting lights in the kitchen of Rassmusen residence is great,the lights buoyed the beauty of the kitchen. I like the simplicity of ELLSWORTH,it’s clean and appealing. The island sink is perfect for this L-shaped kitchen. I love to cook a lot of foods if my kitchen looks like this designs. Rassmuen residence has the good ambiance for a kitchen.. I think I need to change the design of my kitchen..and may be 1 of my plan will be like this but I’m still open for other option. I really love your site Jessa,you really inspire me and you gave great ideas for my future house.